Each section of the SICO® 2000 mobile folding stage rolls freely on its own four wheels to wherever it is needed. No heavy sections to lift and carry, and no deck or frame caddies to bother with. This stage is designed to be set in place, then taken apart and put in storage by just one person. 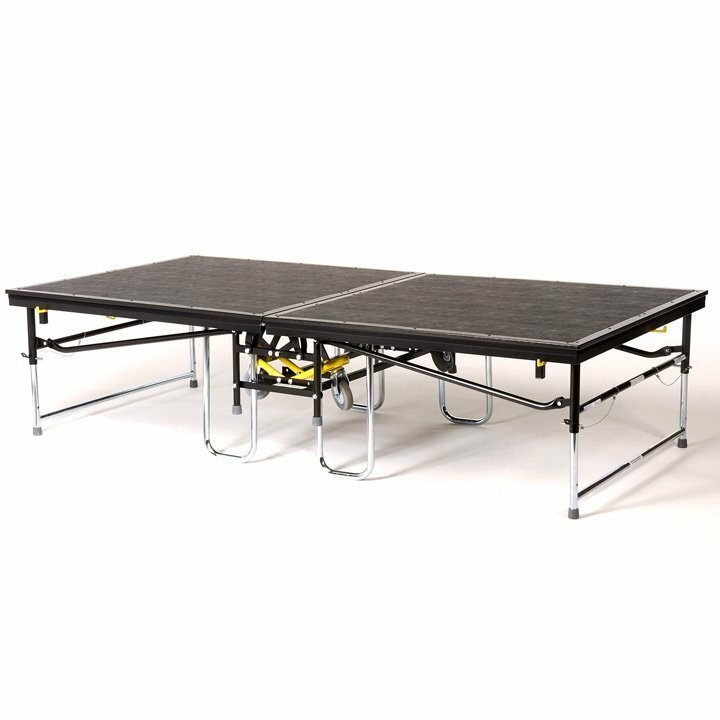 The SICO® 2000 Series stages can be used as a performance stage, a head table riser, a runway, a speaker's platform, or set up multiple units for musical group risers. Because each section of the SICO® 2000 mobile folding stage can be moved by one person, the cost savings in labour and set up time are substantial. Since each stage unit is self-contained, there is no need for bulky deck or frame storage caddies. This unique feature not only saves time and money, but valuable storage space as well. SICO® offers everything necessary for complete, professional staging: backdrops, steps, stage skirting, corner sections, guard rails, chair and table stops, and caddies for moving stage skirting and guard rails. With health and safety in mind, SICO® strongly recommends the use of guardrails with all of our stages and riser systems. The SICO® 2000 Series stage has been used and recommended by more schools, hotels, clubs, and convention centres than any other portable stage on the market. Standard Cloud Grey carpeted decks or tuff deck vinyl. Available in single height and dual-height models (15 or 20cm increments). Units are available in 122 x 244cm and 183 x 244cm deck sizes. The larger 183 x 244cm size allows for a third fewer units to purchase, fewer units to operate, and fewer units to store versus conventional 122cm x 244cm sizes. Take advantage of the free space analysis drawings which will provide you with the appropriate number of stages and stage accessories for your facility. 3-Year Warranty with a Lifetime Warranty on welds.